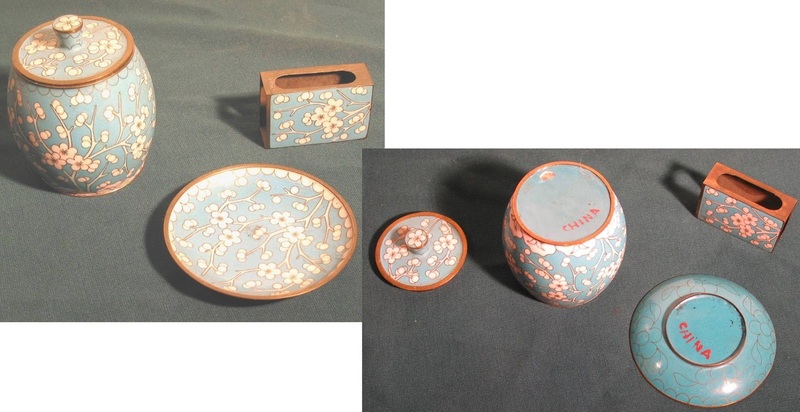 This little cloisonne smoking set turned up recently. The jar is only about 8 cm tall (3 inches), not counting the knob on the lid. The jar shape, as well as the flower pattern on the back of the small dish, are very similar to the pre-World War II set featuring dragons mentioned in the post on the JingFa cloud. 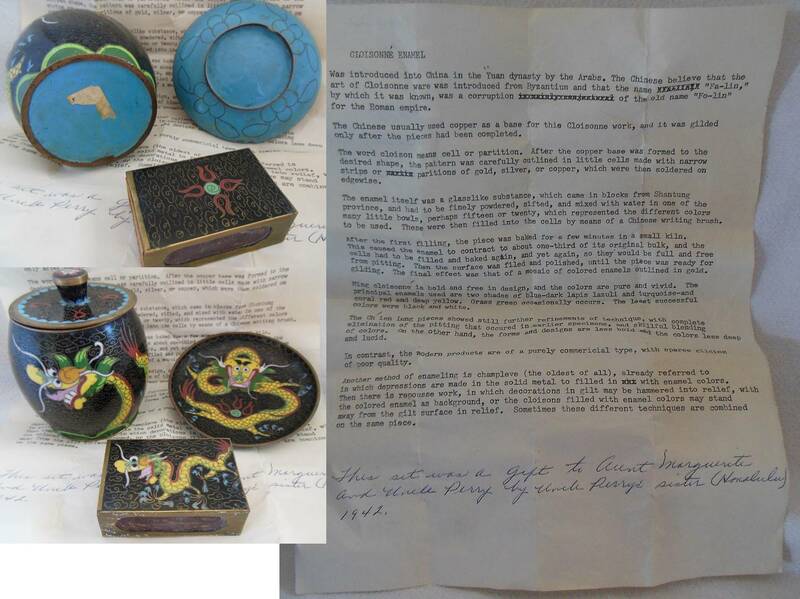 The script at the base of the letter reads, "This set was a gift to Aunt Marguerite and Uncle Perry by Uncle Perry's sister (Honolulu) 1942." 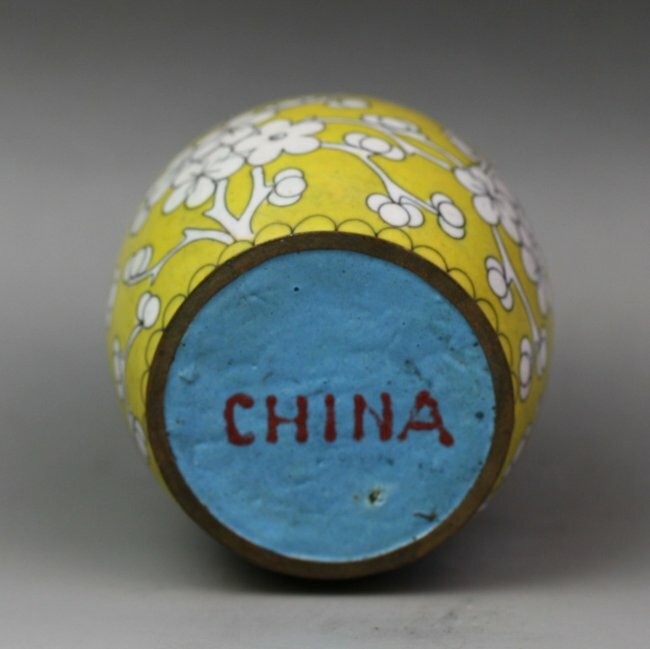 As the Japanese invasion of China began in 1937, and foreigners were rounded up and sent to prison camps in 1941, this set most likely was obtained in China during the 1930s, before the start of the war, then somehow found its way to Hawaii. 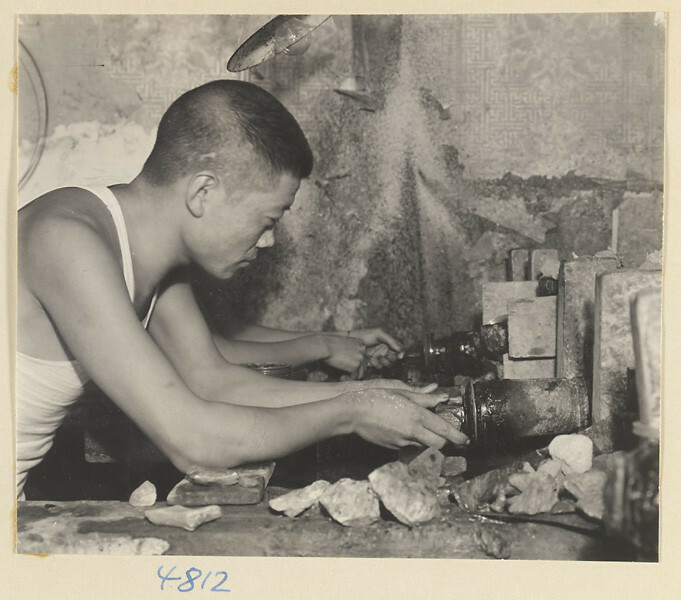 For example, Helen Burton notes in a letter, "some time before internment I had sent some of my stock to Honolulu." The dragons are typical 1930s style, with jellybean chins and humorous expressions. 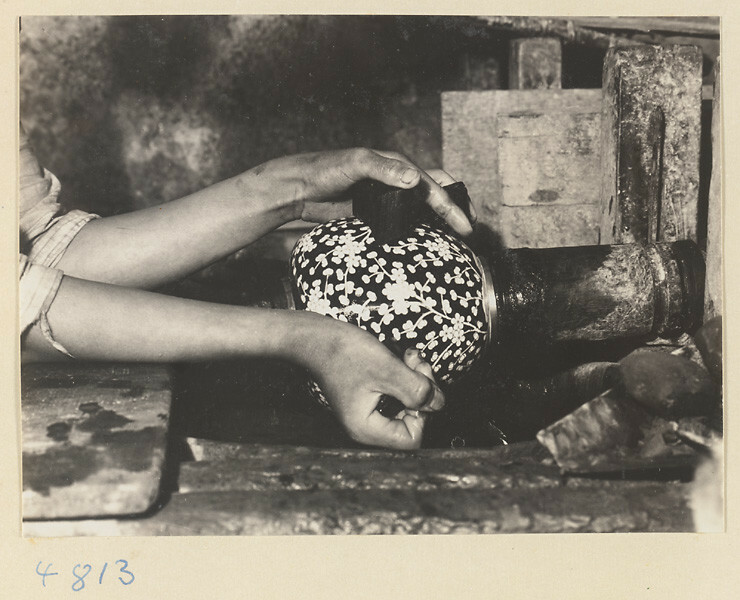 The plum blossom motif of the set called to mind this series of photographs of a cloisonne workshop, taken by Hedda Morrison sometime between 1933-1946. 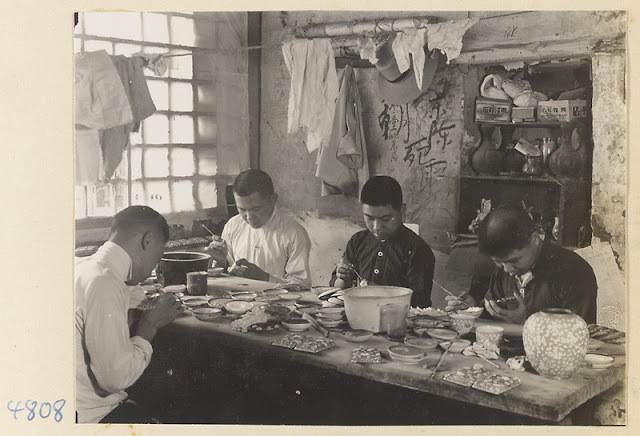 The war with Japan was conducted from 1937-1945, so it seems such peaceful workshop scenes were most likely photographed sometime during 1933-36? The artist I've nicknamed "Old Man" creates the wirework design, which seems to be plum blossoms. He appears to be working directly in wire, without bending the wires to match a separate paper drawing first. Perhaps he sketched the basic composition onto the jar first, then bent each little wire to complete the details, as if he were "drawing" with wire. 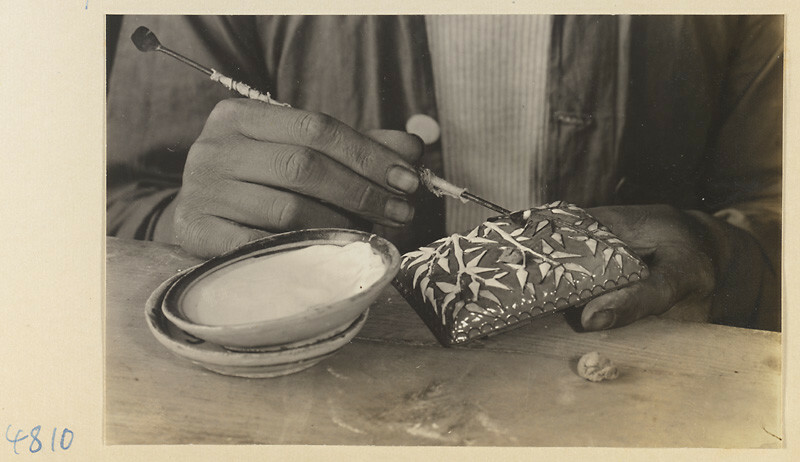 Craftsmen filling in the wirework with enamel slurry. 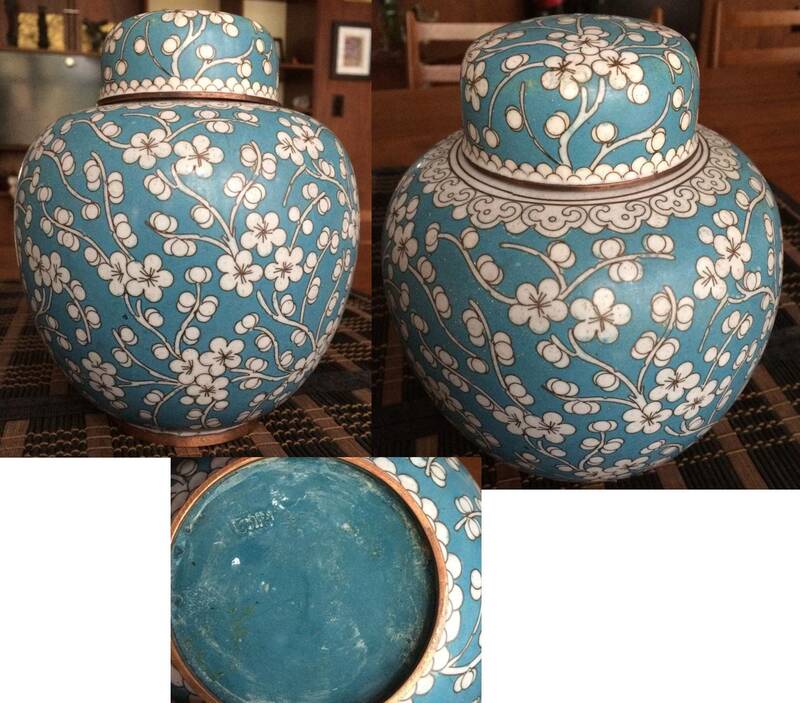 Old Man's jar, or one like it, seems to be on the right hand end of the table. What appear to be box lids are also shown. 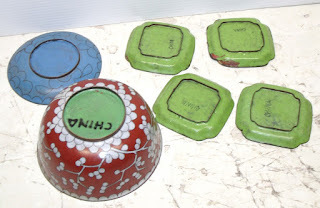 On the back shelf appear lobed vases awaiting wirework decoration? 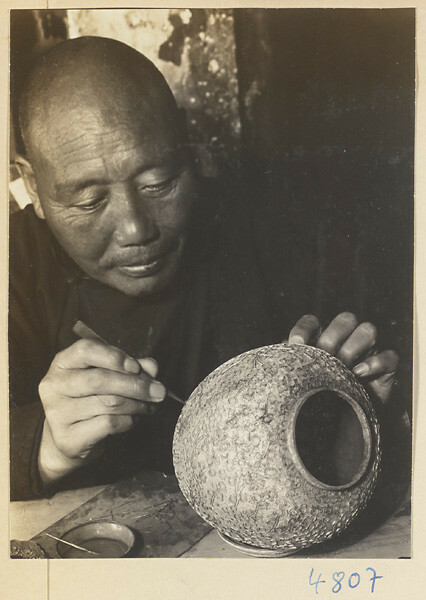 Secondary application of enamel slurry into a bamboo pattern, after the first firing? The shop seems to have also done painted "Canton enamel" work. 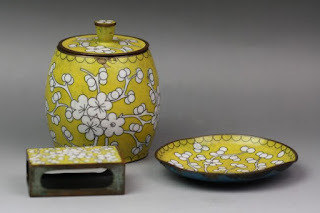 Firing small dishes to melt the enamel? Are they held over what appears to be the opening of the kiln, or somehow inserted into the opening? The Wikipedia article on enamel indicates a temperature between 750-850 degrees Centigrade is required. 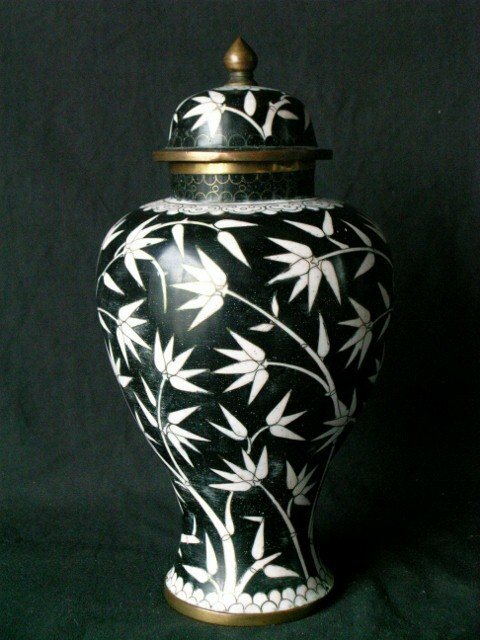 Final polishing of jar, using charcoal? 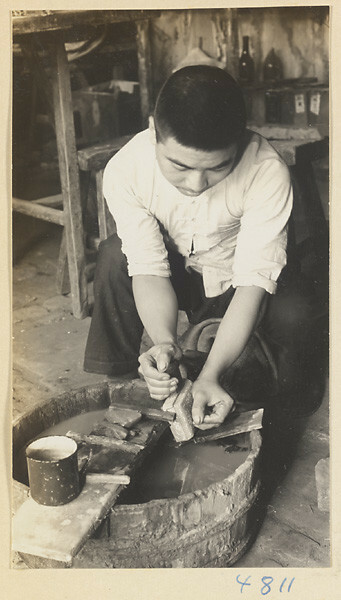 Hand polishing a small box. 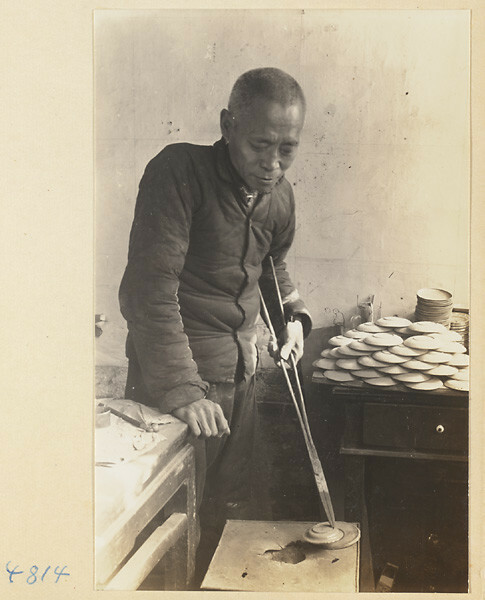 The Hedda Morrison archive can be accessed via the Harvard-Yenching digital library. 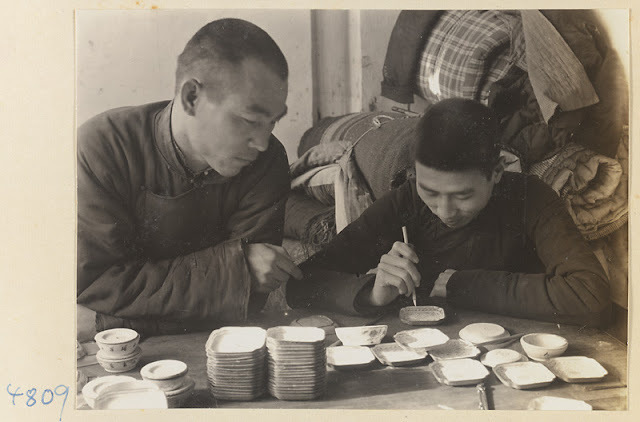 I found these photos with a simple search on the term "cloisonne" + limiting the search to the Harvard-Yenching Library. I wonder if the simpler two-color design was a response to a need to create less expensive pieces, due to the worldwide economic downturn caused by the Great Depression? 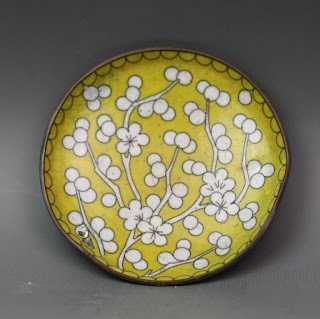 The designs rely upon the spacing of the motifs to stabilize the enamel and keep it from flowing or clumping - there is no background diaper of wan frets or tiny clouds. 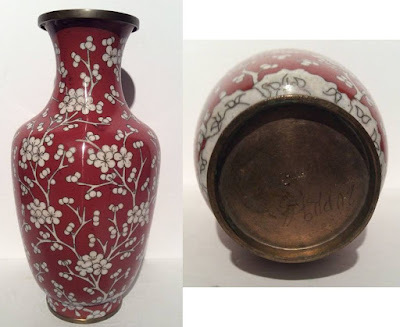 The "bamboo shoots" pattern around the base seems to appear often in pieces from the 1920s-30s. The box being polished in the Hedda Morrison photo also seems to have these little round ball feet? Pink blossoms against a blue sky. Colorful little blossom bowl featured in the post about the JingFa blossom bud. 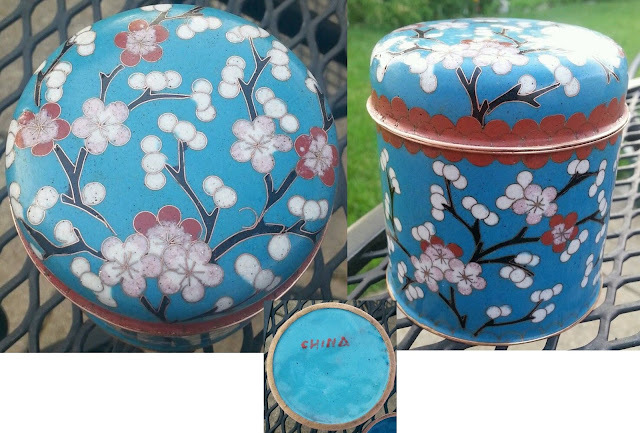 Cloisonne and canton enamel pieces similar to those in the workshop pictures. The background of those pieces did not have wire, I think they were not very common in Chinese cloisonne.